Equine Second Chance was an original idea of its founder, Dana Luther. On January 15, 2007 her idea to save horses transformed into a reality. Soon with the help of kind, caring individuals, ESC began to grow and has now become a large non-profit organization in western North Carolina. The first two horses ESC rescued was a story in itself! On one of the coldest days you can imagine, ESC staff was notified about two emaciated equines in great need of help. Upon arrival we saw a small shed along with an even smaller fenced in area. There was a small pond beside the shed and it was frozen over. Standing side by side up to their knees in frozen mud was the two animals that used to look like horses. We walked to them because they were too weak to walk to us. These horses looked like matted up fur covered skeletons! As we woke them up from the bad dream they had been suffering through, we loaded them into our warm horse trailer so they could come home and enjoy a new found reality. ESC staff took the horses directly to the veterinarian and they were thoroughly checked from head to hoof. The veterinarian did not think they would live through the night. He gave us specific medical instructions for them and we followed them without flaw. ESC staff was fighting around the clock to save these two horses. Although these equines were sickening to look at we saw them in the perfect form we hoped they would blossom into. We named the smaller of the two horses Brighty, for he looked like an Arabian donkey with a very thick matted brownish coat. The other horse was taller and we named him Georgia, hence the state he was rescued from. Georgia was a bay Morgan cross and his coat was thick and matted also. And so their rejuvenations began! Within six months they both gained enough weight to be considered healthy. They were groomed until their coats were in great condition. When summer came and they shed their winter coats these two horses didn’t look like the same ones that came to ESC. 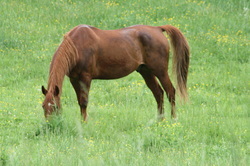 Brighty’s coat, once dull brown, had turned out to really be a reddish sandy roan. Georgia’s coat, once a faded bay, shed into a deep red bay also known as a blood bay. Once they had regained their health, ESC staff started riding them on a regular basis. Now they have both been adopted! At this point you can guess our ESC process: rescuing the horses, rehabilitation of the horses, and adoption or sponsorship of the horses. This is how ESC makes a positive difference one horse at a time. Now ESC houses approximately eighteen rescue horses. A select few are ready for you to adopt. This is only the tip of the iceberg when you sit back and really think about ESC. Please come experience and enjoy ESC in person and get a good up close and personal look at our horses. There may be a special horse just waiting on you to get here!! ESC is now expanding its operation to build a program to help its horses and humans. The connection between horse and human is amazing and the bond that is created will never dissipate. ESC is always open to donations and private funding to help build its programs. Please take a look at our Wish List. ESC greatly appreciates your valuable help and positive intentions. Please, we urge you in all confidence by helping ESC to reach its goals. Our Mission: Our mission is to help abused, neglected, and abandoned horses by not just providing a safe haven and basic needs, but the love and respect that every horse deserves. Provide emergency relief, shelter, care, and rehabilitation for horses in need. Provide adoption services for rehabilitated horses, so that may be placed in a compatible and loving home. Provide equine education and information to commitites to help people facilitate the care of their own animals.